My patients always ask me if there is anything they can add to their diet to improve their fertility and the first thing I recommend is bone broth which is packed full of essential vitamins, minerals and collagen. It is very easy to make and is well known in many different cultures as a nourishing homemade remedy to take when feeling run down or ill. In terms of fertility, bone broth is a superfood as it helps the digestive system which in turn supports hormonal health. Studies conducted on bone broth have found that it can help maintain health in a myriad of ways. * It promotes strong, healthy bones and teeth as it contains high amounts of magnesium, calcium and other nutrients that play an important role in healthy bone formation. * Heals and seals your gut, and promotes healthy digestion. The gelatin found in bone broth is a hydrophilic colloid which attracts and holds liquids, including digestive juices, thereby supporting proper digestion and adequate hydration. * Reduces joint pain and inflammation, due to glucosamine, chondroitin sulphates, and other compounds extracted from the cartilage of the bones. * Fights inflammation as certain amino acids such as glycine, proline, and arginine present all have anti-inflammatory effects. * Arginine, for example, has been found to be particularly beneficial for the treatment of whole-body inflammation or sepsis. Glycine also has calming effects, which may help you sleep better. * Promotes healthy hair and nail growth, thanks to the gelatin in the broth. * Inhibits infection caused by cold and flu viruses. A study published over a decade ago found that chicken soup has medicinal qualities, significantly mitigating infection. Amino acids in bone broth, like arginine, glutamine, and cysteine, have been shown to boost immunity in humans and animals. You can use beef bones, chicken carcasses or fish bones. * Place the bones in a large stainless steel pot and pour in cold water to cover the bones. * Roughly chop the vegetables and add to the pot. * Bring to the boil and cover with a lid. * Reduce to a low heat and simmer for at least 12 hours until the bones are breaking up. * Strain the liquid and let it cool down before storing in the fridge. * If you are worried about leaving the broth cooking overnight, turn off the heat and keep it covered until the following morning and continue cooking it then. * You can also use a slow cooker to prepare the broth if you prefer. * The broth can be stored in the fridge for up to a week. 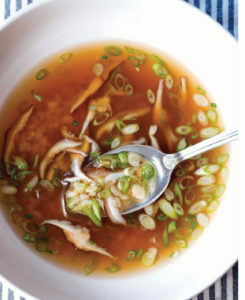 * When the broth has been in the fridge overnight you will notice a layer of fat on the surface, simply scoop this layer off when preparing it as a drink. * Drink a mug of it every day as a medicinal drink or use it as a base for soup by adding pak choy, chives, mushrooms and noodles. * You could also freeze the broth into ice trays and add them to stews and soups. This entry was posted in Uncategorized and tagged Bone broth, Fertility, nutrition. Bookmark the permalink.